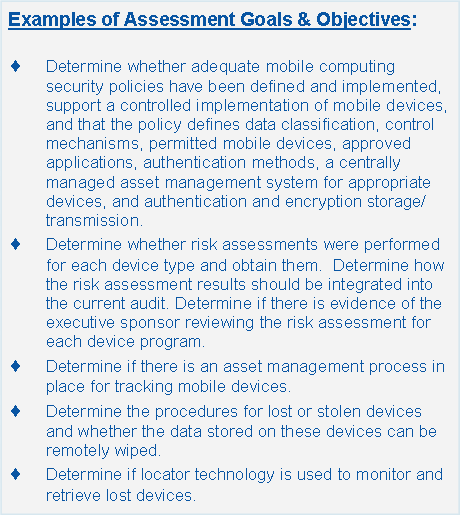 Mobile Application Security Assessment - eDelta Consulting, Inc. Many employees are provided mobile devices that let them work anywhere Internet is available. This has become necessary in today’s business world, but many of these devices have sensitive and confidential information, and many employees use unsecured networks that jeopardize such information while working away. Our team will evaluate the controls and assess the policies and procedures governing the use of mobile devices, including also digital cameras; radio frequency identification (RFID) and mobile RFID (M-RFID) devices for data storage, identification and asset management; infrared-enabled (IrDA) devices such as printers and smart cards; and, other portable Universal Serial Bus (USB) devices for storage (such as thumb drives and MP3/4 devices) and connectivity (such as Wi-Fi, Bluetooth® and HSDPA/UMTS/EDGE/GPRS modem cards), that enable remote access to business networks and the Internet, and the transfer of mass data to non-business equipment. To identify the types of mobile devices, eDelta will create a baseline document that compiles a complete inventory of your organizations mobile devices, categorized by the type of inventory item, manufacturer, and the department and operational area. This baseline may include the current inventory of laptops, notebooks and netbooks, Personal Digital Assistants (PDAs), smartphones, and tablets as well as their associated operating systems, platforms, protocols, manufacturers, service providers and contract information. Finally, we bring with us some of the top security experts in the area of mobile security who understand the most current threats and solutions – tailored to your organization.